Ask fellow campers about "Volga River State Recreation Area - Lakeview Campground" and nearby attractions. We loved our stay at this State campground. The sites were very spacious with huge side yards. Many of the sites are paved and all sites include a large picnic table and a fire pit. There are a lot natural wildflowers that makes for nice scenery. Many miles of trails are available for hiking. We really enjoyed this campground. We camped at Volga River State Recreation Area - Lakeview Campground in a Motorhome. The $23 rate listed includes the ReserveAmerica.com registration fee of $4. Perhaps the nicest publicly owned (State, County, etc.) campground we've had the pleasure of staying in. Check out my (theretiredcpo) video review on YouTube. 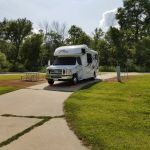 We camped at Volga River State Recreation Area - Lakeview Campground in a Motorhome. 40 minutes drive to the Bily Brothers Clock Museum in Spillville, IA. My wife thought I was nuts, wanting to go to this tiny museum of hand-carved clocks from the years 1913 to 1958. She was quickly converted! See the Iowa Public Television YouTube video. About forty minutes in another direction is "The Little Brown Church", a historic church in Nashua, IA that was made famous by a song, The Church in the Wildwood. The lake was beautiful. The park was well maintained. Fellow campers were friendly, and the camp host was attentive. We have Labradors and there was ample room for them to romp and play. Everyone was hard at work preparing for an upcoming archery event. 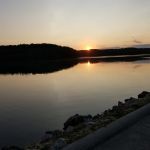 We camped at Volga River State Recreation Area - Lakeview Campground in a Motorhome. For internet we visited the local library. There was a nice BBQ restaurant and produce stand nearby. Campground was very busy with lots of families and a flurry of activity. We had a pull through site that was plenty big for a 38' 5r and tow vehicle. Had picnic table and fire ring. The campground overlooks the sewage treatment facility that is directly adjacent. The authorities ought to consider putting some vegetation up to screen the view of the settling ponds and sewage agitator pumps from the campground. We did not smell it, but maybe the wind was in our favor that day. The campground is about average. There are lots of trails through the recreation area, but are mostly fit for and used for horses. This park is largely geared towards horses, and there is a second campground that is set up for those bringing horses with them. The prices, like all Iowa State Parks is very reasonable at 14 dollars. We camped at Volga River State Recreation Area - Lakeview Campground in a Fifth Wheel. 40 minutes drive to the Bily Brothers Clock Museum in Spillville, IA. My wife thought I was nuts, wanting to go to this tiny museum of hand-carved clocks from the years 1913 to 1958. She was quickly converted! See the Iowa Public Television YouTube video. About forty minutes in another direction is "The Little Brown Church", a historic church in Nashua, IA that was made famous by a song, The Church in the Wildwood. Are you affiliated with Volga River State Recreation Area - Lakeview Campground ?